Welcome to My World on Thanksgiving! Canada has Thanksgiving, but almost a month ago, so it’s just another workday and the emails keep rolling, especially on their release of a new remittance report. 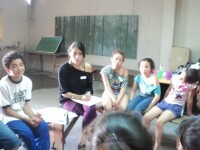 Pictures in this morning finally from Buenos Aires on a recent human rights workshop in La Matanza, which the organizer had time to send since a general strike yesterday shutdown the city and most of the transportation. Skype conference call today to prepare for our setting up the field program next week in Ecuador for the national elections in five provinces. The election may be over in the USA, but ACORN International members are examining slates, programs, and plans for elections this coming year not only in Ecuador, but also in Honduras, Kenya, and Indonesia. Work slowed in Mumbai as our operations in Dharavi with many Muslim members battened down the hatches as the shock troops of the right parties hit the streets to mourn the death of communalist instigator Bal Thackery. Newspaper reports indicate that police have picked up two young women who questioned the respect being given this man on Facebook. Social Policy went to printer yesterday for the fall issue, so proofs have to be checked out today, so issue hits mails internationally and domestically next week. Interesting hour long conversation yesterday with David Moberg, labor reporter at In These Times, about organizing strategy and the work being done by UFCW at Walmart these days in USA. Interesting reports from ACORN Italy on new legal services support being rolled out for our members there with more details to follow. Early morning email from Belgrade where a former ACORN organizer in Ottawa is starting the process of seeing if an ACORN Serbia can be built there in coming months. As I write this, I’m bouncing back and forth on Skype notes, about how to integrate community organizing into an on-line medical training course being offered globally and recently accepted as a pilot for 500 med students in Sudan. They asked that I block dates in November 2013 to speak with them at their conference in Thailand potentially. Double checking the schedule at Fair Grinds Coffeehouse so we can fit in the meeting after the holiday on how well we are doing on our environmental footprint and sustainability measure, making sure we are staffed fully on Thanksgiving because our community needs us, approving another group to play soon and another yoga and dance time slot, and getting ready to host the Tides Foundation JBL Awards presentation next week. There’s always a lot to be thankful for on Thanksgiving and this small sample reminds me how lucky I am many decades ago to have found work that teaches me daily and resists boredom no matter the tedium of tasks, and where so many of us have developed small skills that can make contributions to the work being done every day around the world to bring justice, equity, and security to so many people. This entry was posted in ACORN International and tagged ACORN Italy, Bal Thackery, Belgrade, Buenos Aires, canada, David Moberg, Ecuador, In These Times, La Matanza, mumbai, remittances campaign, Social Policy, Thanksgiving, Tides Foundation by Wade. Bookmark the permalink.